A 45-year-old male with a past medical history significant for chronic chest pain syndrome and a past surgical history significant for a coarctation repair 14 years prior. The coarcation repair was performed using an 18mm Gelweave bypass graft between the descending thoracic aorta and left subclavian artery. The patient developed graft thrombosis one year ago and was treated with long-term anticoagulation. On presentation, the patient complained of acute substernal chest discomfort radiating to his back. Vital signs and physical exam were normal. There were no pulse deficits or radio-femoral delay. A CTA revealed a dissection flap involving the synthetic graft without evidence of graft thrombosis. The patient was treated conservatively with B-Blockers and continuation of his anticoagulation medication. One month later, the patient returned with similar substernal chest pain. Repeat CTA demonstrated patent graft with chronic dissection. The patient was scheduled for evaluation of his graft at an outside facility. 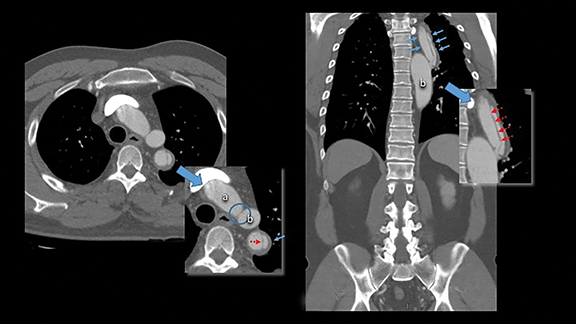 CT angiogram was obtained (Figures 1 and 2), which demonstrated coarctation of the aorta and bypass graft between the left subclavian artery and the descending thoracic aorta. A dissection flap within the graft was noted along its entire length with equal contrast opacification of the true and false lumens. No evidence of graft thrombosis. Additionally, there was narrowing of the side-to-side anastomosis of the graft with the aorta (Figure 2). This narrowing was stable on comparison to prior imaging. We report an unusual graft complication, a pseudointimal graft dissection in a patient after repair of coarctation of the aorta. While extremely rare, this case highlights that synthetic grafts can dissect their pseudointima. Intimal hyperplasia can extend beyond the anastomotic site, as suggested in our case where the dissection flap spans throughout the graft. This complication should to be considered in evaluation of patients with synthetic grafts. Troost E, Gewillig M, Daenen W, Meyns B, Bogaert J, Van Deyk K, Budts W. Behaviour of polyester grafts in adult patients with repaired coarctation of the aorta. Eur Heart J. 2009 May;30(9):1136-1141. Kalkat MS, Thorne SA, Guest P, Bonser RS. Management of re-coarctation due to prosthetic graft pseudo-intimal dissection. Interact Cardiovasc Thorac Surg. 2007 Feb;6(1):83-84. Shigematsu K., Shigematsu H., Nishikage S. et al. Non-anastomotic midgrafts stenosis of a knitted Dacron graft after arterial reconstruction. Report of a case. International Angiology. 2001 September;20(3):248-250. Hokken RB, Spitaels SE, Hagenouw RR, Bogers AJ. Dissection in a right-sided porcine-valved Dacron conduit. J cardiovasc Surg (Torino). 2000 Feb;41(1):57-59. Spadaccio C, Rainer A, Barbato R, Chello M, Meyns B. The fate of large-diameter Dacron® vascular grafts in surgical practice: are we really satisfied? Int J Cardiol. 2013 Oct 12;168(5):5028-5029. Elsharawy MA, Naim MM, El-Daharawy MH, Shekidef MH, Ahmed IH. Effect of anastomotic length on the development of intimal hyperplasia in the distal anastomosis of bypass graft. Vascular. 2010 Sep-Oct;18(5):256-263. Margolin DA, Kaufman BR, DeLuca DJ, Fix PL, Graham LM. Increased platelet-derived growth factor and intimal thickening during healing of Dacron grafts in canine model. J Vasc Surg. 1993 May; 17(5):858-866. Jubouri S, Razmjoo M, Kanzaria P. Spontaneous pseudointimal graft dissection in a patient with coarctation of the aorta. Appl Radiol. 2017;47(1):30-31. Prepared by Dr. Jubouri while a Radiology Resident, Dr. Razmjoo while a Radiology Resident, and Dr. Kanzaria while serving as the Radiographics Division Director, Assistant Program Director and Radiologist at Saint Vincent Hospital in Worcester, MA.